We pulled into a slightly lopsided parking lot one Saturday morning, typically reserved for weekday customers of nearby businesses, and looked across the street at the happy crowd gathered outside of Eat Chow in Costa Mesa. Some must have been waiting for their other breakfasting friends to arrive but others were queuing to get a table at the bustling place. It was a weekend crowd and not uncommon for this popular hot spot which has gathered enough devotion with this and their Newport Beach locations that a third spot is in the works for Santa Ana. We sat down with coowners Brian McReynolds and Amy Curran to see why it was that Instagram and Facebook feeds have been filling up over the years with pictures of happy dishes and guests. Brian: "We're all over the place but if it is something we like, we'll put it on the menu. We have been switching out menu items a lot lately, and we run specials. If they're a hit, we'll put them on the menu." Amy: "The menu originally was a lot smaller but what would happen would be that we'd run a special and take it away but a lot of customers would wonder what happened to it and ask to bring it back. We have such a regular clientele so we try to please everyone and our kitchen is like, 'STOP!'" 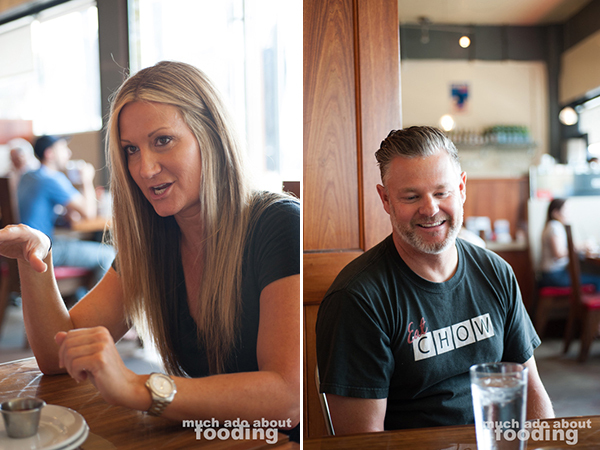 Originally opened with another partner, Eric Doran, who has since passed away, Eat Chow had several influences when it came to the cuisine. Eric trained at CIA and had a large Southern influence in cooking style and upbringing so several of the dishes have that theme. Brian himself was trained in French-European style so is able to bring that aspect to the table, and the inclusion of Amy to the team lent a Californian flair to the whole project. The two also are extremely influenced by intercontinental and ethnic cuisines so try to adapt those perspectives for their guests. Did the name come from wanting cuisine freedom? Brian: "We were standing outside, going over names but it seemed like we were trying too hard. Names like 'Equinox' or so. 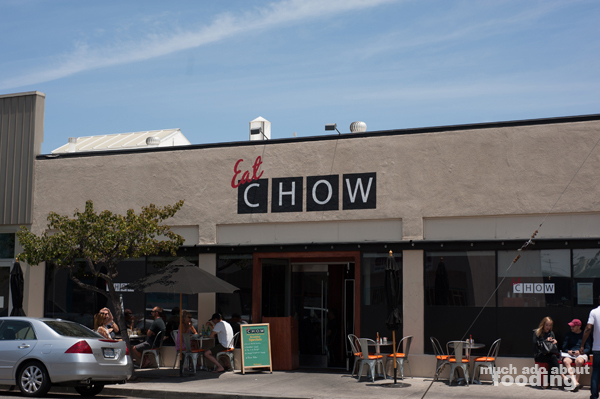 Then we came up with Eat Chow, and I could immediately see it, the whole logo." Amy: "We don't want to try too hard or appear that way. We just come up with things that we like, had in our childhoods, and saw in a magazine." The restaurant easily could have become the barbecue place the founders originally wanted to open but upon seeing the space, it only made sense to put together a cafe-style establishment. Sandwiches dominate the menu to perpetuate a diner feel but they focus on making the food fine dining quality without the gourmet fuss. For example, it would not be uncommon to spot gastriques, beurre blancs, and aiolis on the menu. What does it mean to "chowify" something? Amy: "It's a term that we use between the two of us when we're developing a dish. To chowify something just means that when we create something and we take a bite, we go back for a second bite. We try to get as many layers of flavors in one bite as we can. One bite is a real experience; does it make you go for another bite? That's our goal - that second bite, that wanting for a second bite. Whenever we create something, we give it to the staff and watch if they took another bite." Brian: "Amy comes along and threw a bunch of items on the menu. She's not confined by being a chef that was thinking things are beneath her. I've been around chefs my whole life and a tomato beurre blanc is normal but other people might have it and think it's so delicious while I'm just thinking it's just beurre blanc!" We witnessed their "chowify" method once we ate their chow. 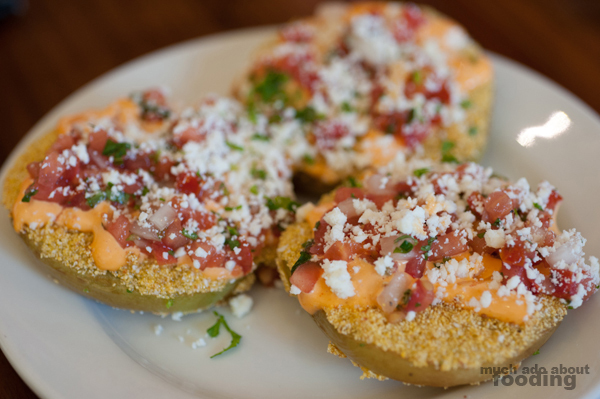 We started with the Fried Green Tomatoes ($4 - chili herb aioli, pico de gallo, and cotjia) which came crusted with cornmeal for a healthier alternative to deep-fried batter. The pieces were substantial, and it was definitely a chowified dish with all of the various sauces on each slice. We also went for a bucket of their signature Truffle Parmesan Fries ($5), which is their most popular appetizer. The thin fries, which were crunchy on the outside but fluffy inside, were addictive. Hot and comforting, these were taken to the top by the balanced use of truffle oil. 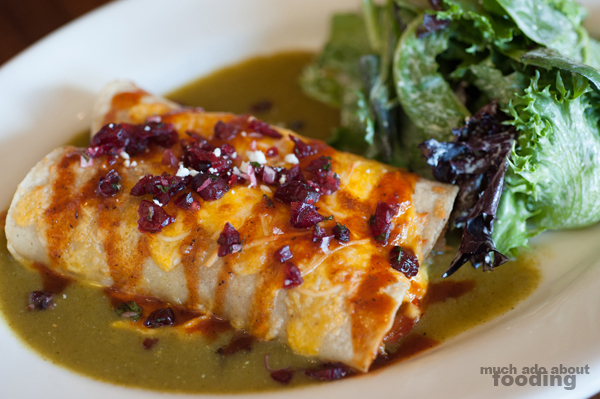 If you're a small plates kind of person, find the rest of your meal on this side of the menu. There is also a substantial section for full entree salads. We spotted at least ten of them but opted for the Spanish Style Roasted Chicken Salad ($12 - paprika marinated chicken, Romaine, mixed greens, shredded cabbage, avocado, sweet corn, goat cheese, almonds, Medjool dates, peanuts, and smoky tomato vinaigrette) which is what's in the first picture of this post. There were so many components to this salad that all played joyfully with each other for every bite and finish. I loved also how appropriately sized all of the pieces were; sometimes I run into salads that get your mouth all dirty from oversized leaves but these were just right. The avocado lent natural creaminess alongside the goat cheese and the almonds interrupted too much of that mouthfeel with something crunchy. I loved the addition of the Medjool dates for their concentrated sweetness in contrast with the paprika chicken's savoriness and saltiness. It was such a balanced salad and a treat in itself. They also recommended their Ribeye Thai Beef Salad ($14) but I'm sure all of the salads are fabulous. Do you have a favorite on the menu? Brian: "I like our Chilaquiles. I like traditional as well but I like the way we do it. Also, the Ribeye Thai Salad." Amy: "The Breakfast Salad is my favorite but we share an Ahi Burger four times a week. 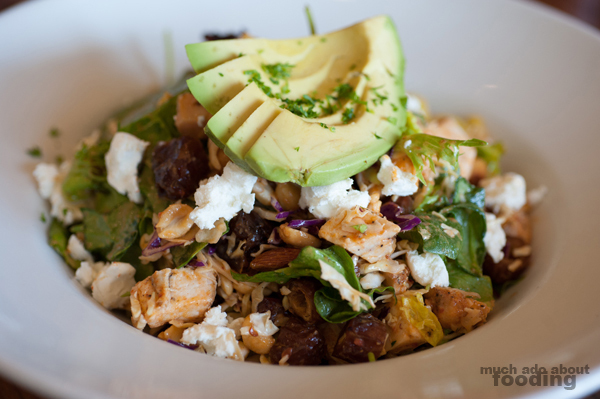 I love our Curry Chicken Salad." How are the chilaquiles different from traditional? Brian: "We deconstruct it and have a guajillo sauce on it with actual guajillos. It's got a smokiness to it. I find when it is deconstructed, the chips stay crisp and gooey at the same time as opposed to gooey." Amy: "That was the dish that put us on the map. For the lunch/dinner menu, the Reuben and the French Dip. The Cubano too." Speaking of smokiness, they also have smoked dishes on a few occasions including a previous special menu item: their Smoked Trout Bruschetta during one of Eat Chow's wine pairing dinners (was paired with a Malbec). They are also smoking poblano peppers for their chicken fried steak breakfast dish but are looking forward to one day having a proper smoker. Even without it though, we found that they had an ability to work with various meats without any issues. Not full yet from the appetizers, we tackled the next section on the menu - How Chow - which included items like Shredded Ribeye Burrito and Ancho and Coffee Crusted 5oz Petite Filet. Since it was one of the sandwiches to put Eat Chow on the map, the Media Noche Cubano ($10 - slow roasted pork loin, smoked ham, imported Swiss, housemade pickles, and spicy mustard) was a necessity. With more than 20 sandwiches listed, the menu had so many tempting options but it is not everywhere that you can find a good Cubano. Pressed tightly together, the sandwich compacted all of the meats to a height that anyone could bite into without failing to get all of the ingredients in one mouthful. It was another dish that practiced the chowify method because we easily went through it quickly, indulging in the smoky, savory, tangy, and spicy flavors. 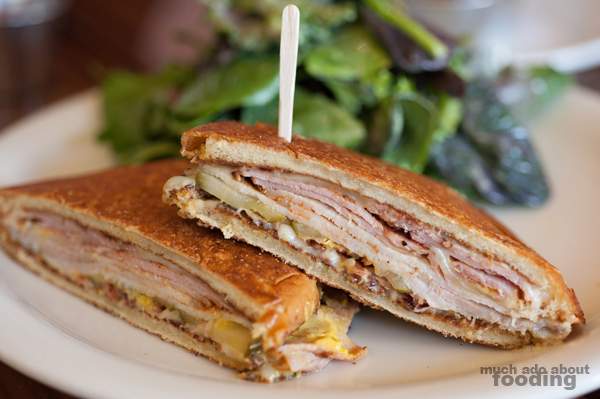 This dish had recently been voted a Best Sandwich by Orange Coast magazine. 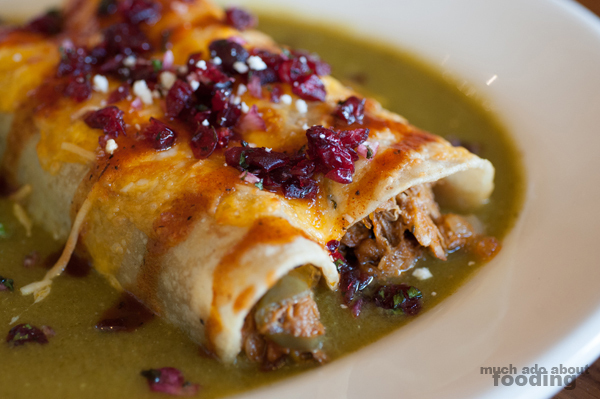 We also picked from the Specials menu and went for their Barbequed Duck Enchiladas ($16 - peppers, onion, tomatillo sauce verde, cherry shallot mint salsa, and mixed greens salad) which was first introduced during a wine pairing dinner as an experiment on the audience. As Amy noted, they had been wanting to add duck to the menu but hesitated, unsure if their demographic would like the gamebird. Luckily, it was a hit and the complexity of ingredients must have played into that. The French influence of Eat Chow presented itself in the cherry and duck matching but the true chowified experienced came from the combination of a cherry shallot mint salsa and a tomatillo sauce verde. What's special on the horizon? Amy: "We used to have a patty melt on the menu and it was not good. It was the bane of my existence and was the one thing I would not recommend. We finally pulled it but for the last couple months, we said we needed to do it and do it right. It's very rare that we come up with something and hit on the first try but this one, we hit it right on the first try. I'm super excited about this patty melt because it's redemption. Caramelized onions (with brown sugar and Worchestershire), a twist on the pickles (Brian put together a homemade jam with Santa Fe peppers, red and green peppers, whole peppercorns, red wine vinegar, and sugar to get that pickled), Grueyere and Muenster, and whole grain mustard. We put it all on the beef patty while on the flatop to melt, and give a Parmesan crust on the bread." The restaurant is well-visited for all meals of the day from breakfast to dinner, often seeing regulars at both locations. During the weekend, there are guests who drive down from Los Angeles and up from south Orange County just to delve into the brunch options. They are excited for the Santa Ana community to congregate once their Downtown Santa Ana (DTSA) location opens and are proud of the space they have managed to procure for this expansion. Located in a red brick building built in 1896, the third spot will still feature the same large windows as Costa Mesa but maintain the old town feel. It was a fateful find since they had thought about expanding even more but location finding is always a difficult part of the process; a local chef friend was able to leverage connections to help them snag a coveted DTSA space. After this, more Eat Chows are in the future with hopes of getting into Long Beach and Corona del Mar and even starting up other concepts. If you have been going to Eat Chow a lot, you can change up the pace by attending one of their wine pairing dinners that happen quarterly. 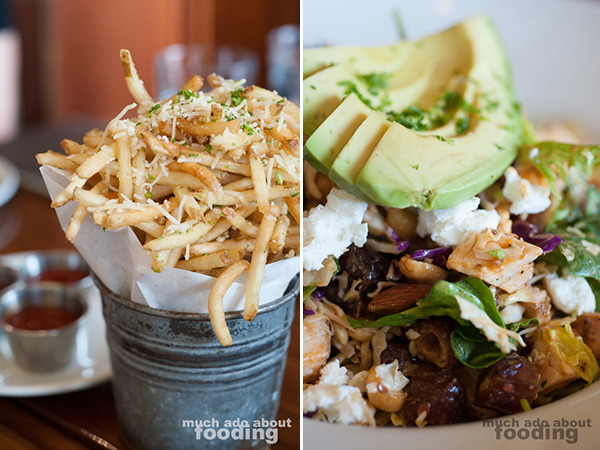 They have held two so far (both at the Newport Beach location) which sell out quickly and are multiple course meals. If wine is not your style, the restaurant also has shochu cocktails and an impressive beer list with beers like Gulden Draak 9000 from Belgium, Einstö'k Icelandic White Ale from Akureyri, Iceland, Hitachino Nest Beer Espresso Stout, and even Stiegl "Radler" Shandy Grapefruit. Alcohol not your style? They are the only restaurant to carry Intelligentsia coffee too! You shan't be thirsty here. Check them out online at www.eatchownow.com (but don't eat your screen!) and visit their Costa Mesa location at 1802 Newport Blvd., Costa Mesa, CA 92627 or Newport Beach at 211 62nd St., Newport Beach, CA 92663.